This booklet is a translation of statements by 50 citizens who were residing in Fukushima at the time of the triple disaster of March 11, 2011. They range in age from 7 to 87, and they wrote these statements as part of the criminal complaint filed with the public prosecutor by the Fukushima Complainants for Criminal Prosecution of the Fukushima Nuclear Disaster. What, exactly, is a criminal complaint, and who is a “complainant”? In this case, the complaint is the formal legal procedure initiated by citizens in response to the failure of both prosecutors and police to investigate the criminal liability of Tepco and government agencies for their roles in the nuclear disaster. The group complaint, filed at the office of the public prosecutor, is a demand for investigation and indictment of the responsible parties. Although several Complainants in this booklet draw a connection between the failure of the state to pursue criminal liability and the difficulty of getting anything resembling adequate compensation from Tepco, it is important to keep in mind that as Complainants, they do not stand to gain anything individually even under the best-case scenario: if, after all the prosecutorial refusals, an indictment is brought, a trial held, and some parties found to be criminally responsible for the nuclear disaster. 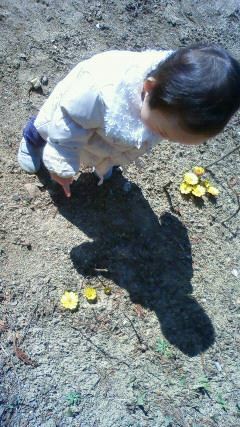 M.K.’s son looking for a sign of spring in the garden – before the 3.11 disaster. 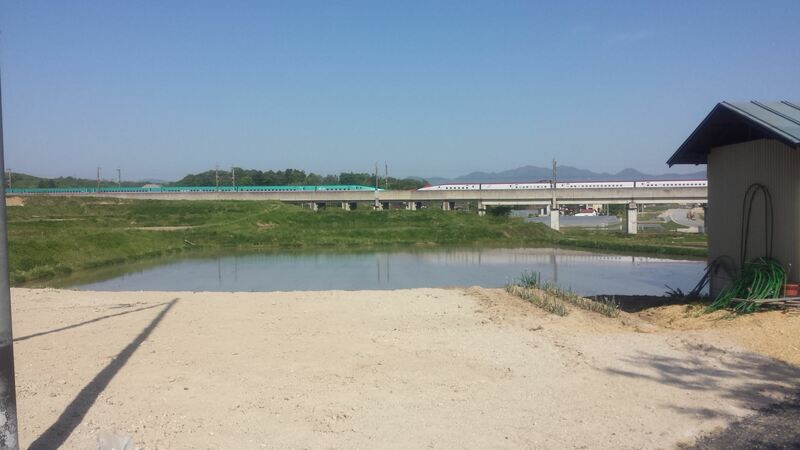 M.K.’s son watching the Shinkansen (bullet train) – his favorite pastime. 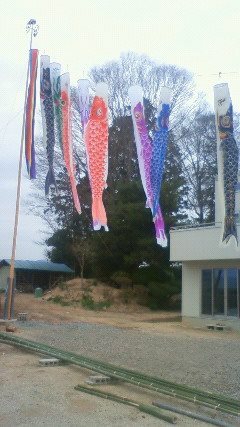 The carps they put up for their son (a Japanese tradition to pray for boys’ healthy growth) the year before the disaster. It turned out to be the only year they could do this. the flowers in the garden they used to have. 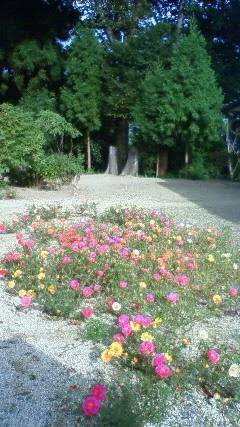 more of the flowers in the garden they used to have. 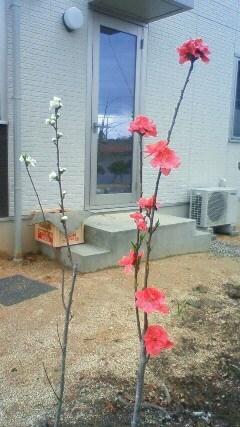 the white and pink peach trees they planted to commemorate their son’s birth. 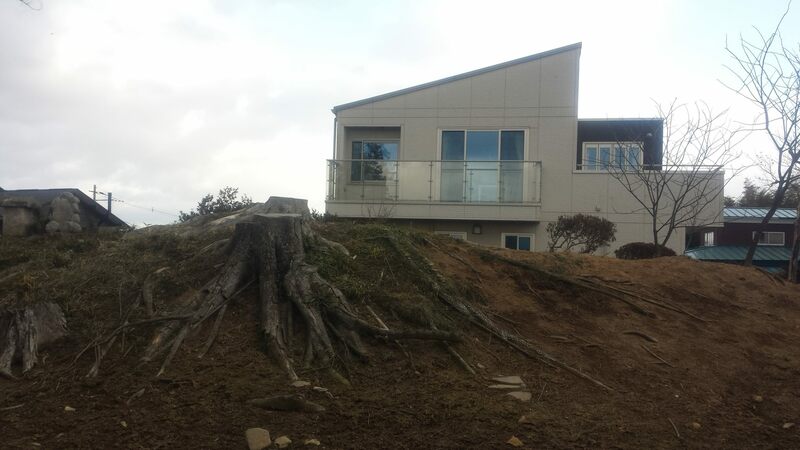 Their house before the 3.11 disaster with big trees. The trees were chopped down for the decontamination work (photo taken on 3rd January, 2015). 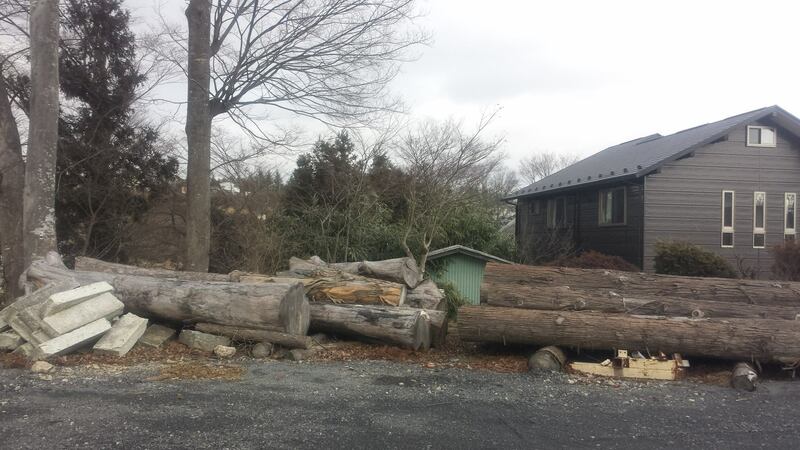 The chopped up trees left abandoned (nowhere to go) in the corner (3 Jan., 2015). 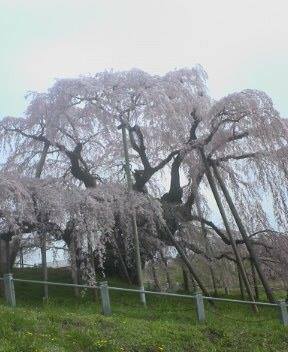 Fukushima’s famous one-thousand-year-old cherry tree called “Takizakura” (waterfall cherry tree). The 1000-year-old cherry tree had to witness the stupid human disaster. The dosimeter showing the radiation level (photo taken in their garden on 4th January, 2014). The empty lot shown here used to be her grandmother’s vegetable garden (6th May, 2015). I will never be able to forget this date: March 11, 2011. I remember it was cold and snowy that day. For the first time in my life I experienced a magnitude 9.0 earthquake. An unfamiliar sound from my cell phone was an urgent earthquake warning. I was getting panicky, wondering what to do, “Earthquake? What shall I do?” When I managed to put a coat on my son, the quaking started. At first it was small, but increased intensity so much that we could neither keep standing nor sit still. Holding my one-year-old son in my right arm and clinging to something with my left hand, I held on so that my body wouldn’t be carried away by some force and waited for the quake to stop. I held on desperately, and the long shaking seemed to last forever. My son and I were in the bedroom upstairs, listening to the terrible noise from the living room downstairs: the sounds of dishes falling from shelves and breaking, bang! crash! I was afraid of our house being destroyed and the thought of our possible, approaching end of our lives filled me with terror. When the main shaking was finally over, I headed for the door to get out of the house and found that the piano had turned 90 degrees and was blocking our way out to the living room. I climbed over the piano holding my son in my arm, stepping carefully on the living room floor with heaps of scattered broken objects and headed for the front door. All the inside doors had broken loose from their door frames and had left the traces of their movement on ceilings and floors. The kitchen unit which had been attached to the wall was also broken off from the wall. Who could have imagined that the whole, heavy kitchen unit could separate from the wall and be moved in an instant like that! Our regenerative room heaters in our living room and bedroom had also been stripped off the wall and fallen down a few meters away from their original places. I found out later that each generative room heater weighed 200 kilograms. While I was enduring the terrible quake in the bedroom holding my son, the regenerative heater fell off the wall and moved, coming near us. When the quake stopped, it turned over a few centimeters away from us. I shudder at the thought that it could have reached us and turned over upon us. When I finally reached the front hall of our house, I couldn’t find a matching pair of shoes. All the shoes and other objects were scattered all over. I put on the first shoes I could grab, though mismatched, and got out of the house. It was very cold and snowing. Without sufficient warm clothes, I was holding my barefoot son tightly. The aftershocks with magnitude 7~9 repeatedly came. My house and the electric pole by it were also violently shaking. Being afraid that they might fall down, I tried to stay away at a safe distance. Soon my father-in-law, who had been working in the area not far away, came running to our place. He had lost his car on the way, for its wheels got half-buried in the ground by the earthquake. The stone graves in the neighborhood were miserably overturned and scattered. Most of the roofs and roof tiles of our neighbors’ houses were also broken down. The nearby water reservoir for agriculture ruptured, and a landslide swallowed some houses burying some people. The evening came and darkness fell. Though it was extremely difficult to contact my husband and other family members, I could finally reach my parents who lived only about 20 kilometers away from us. They hadn’t suffered as much damage as I had. Only some little things had fallen off. I decided to flee to my parents’ house with my son at that time. 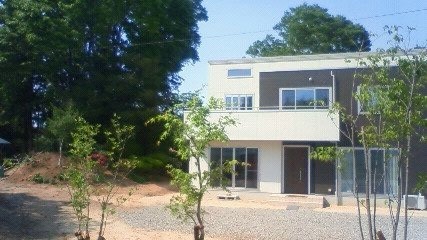 My parents’ house actually was only about 40 kilometers away from Fukushima nuclear power plants. But I decided to seek temporary shelter there because I couldn’t have envisioned that there would be nuclear explosions. I could not go to sleep that night, hearing the ceaseless rumbling sounds of the earth due to aftershocks. My son cried all night until his voice became hoarse, unable to have a good night sleep. We could meet up with my husband finally three days later. A new day came. It was the day when the Fukushima Daiichi nuclear power plants exploded despite the common belief, “safety assured.” Electricity was working at my parents’ house and so we could watch TV news. The official warnings changed from “Take indoor shelter” to “evacuation” orders and we couldn’t contain our increasing perplexity. As Mr. Edano, the then Secretary General of the Cabinet, only repeated “No immediate effect on health,” our anxiety nevertheless became intensified. We were only 40 kilometers, just a stone’s throw, from the nuclear reactors. It was only a matter of time, I thought, until we would hear some kind of concrete direction about what to do. My parents’ town had already accepted 2,000 evacuees from a town within 20 kilometers from the reactors and was under strict caution. The evacuees came with their town officials and gave the latest news of their situation to our town. Soon we started to hear the public disaster alarm through the wireless announcements. The guidance was given to all citizens to stay indoors, to turn off heaters no matter how cold it was, and to seal up windows and doors. We learned that potassium iodide tablets were going to be distributed among all the residents under 40 years of age. I learned about “potassium iodide” for the first time in my life. An explanation read that taking potassium iodide right before or right after a large dose of radiation exposure can protect people from serious radiation poisoning, though its effect would last only for 24 hours. The news of distribution of the emergency medicine, which we would not have to take in our ordinary daily lives, shook me with a sense of its extraordinary seriousness. My hands started trembling. “We must get out of here quickly,” I thought while waiting for the tablets to arrive. We, however, never received any tablets because neither my son nor myself were registered as residents in my parents’ town. They hadn’t prepared any extra tablets for outsiders. I repeatedly begged some for my son only, but to no avail. Desperately I called one office after another and begged. I tried the health center, the prefectural government, and radiation research center, etc. But none could respond my desperation as a mother wanting to protect her little boy. I understood that they couldn’t help me because we were not registered citizens there. But it was agonizing for me not being able to give my son the preventive medicine from possible radiation poisoning. What else can I say? The frustration, sadness, resentment, all these emotions I had to go through while looking at my little son, unable to protect him from radiation, vividly come back sometimes and disturb my sleep even today like a nightmare. Never do I seem to be able to forgive myself for the inability to help my own son. After all, fleeing as far as possible from the nuclear power plants seemed the only way to take now that there were no protective tablets available for us. I decided to go back to my house, which was not in any habitable condition and was 65 kilometers away. The area would be less contaminated than my parents’ town, I assumed. However, I did not know that I was going to regret my amateur assumption later. A few days later, I found out that my city, 65 kilometers away from the nuclear power plants, had a several times higher radiation level than that of my parents’ town, 40 kilometer away. Unable to obtain proper information, I had evacuated into the area with higher dosages of radiation. Nobody gave us proper information as for where to evacuate or where we could have avoided radiation exposure. On the contrary, the central and the prefectural governments suppressed information from us while they had information through the SPEEDI (System for Prediction of Environmental Emergency Dose Information). I blamed the central government and TEPCO, thinking, “I would never have gone to a higher dosage area if only they had given us information. They could have reduced our radiation exposure a great deal.” I remonstrated, over and over again, the man-made nuclear power plants for causing the man-made disaster and then again, humans for even multiplying the damages. However, for the first time I admitted to myself that I had been ignorant of and even not interested enough in nuclear power and radiation effects while living in this country with so many nuclear power plants. It was too late to regret: Radiation exposure cannot be undone. Time in the past cannot be recaptured. I heard later that many of the evacuees from the off-limit zones had carried potassium iodide tablets with them. However, I also heard that they failed to take them effectively, right before or immediately after the nuclear fall out, due to the absence of proper instruction from their governments. They suffered, as a result, from radiation exposure which they could have avoided. In a few days since the disaster, my stress was extremely high due to the worst fear that I had ever experienced in my life. My only desire was to get away from radiation and to protect my son. Without information I could rely on, I couldn’t trust anything nor depend on anyone. I couldn’t imagine myself living on in that terrible state of fear. The earthquake disaster was bad enough, and how would I be able to endure the worse fear of radiation harm, which is unidentifiable and indefinable. There was only one thing I could do, i.e., to leave Fukushima. I made up my mind to evacuate. However, I immediately encountered the realistic problem of not having means to move out. Neither Shinkansen trains nor highway buses were running. I made a reservation for a flight out of Fukushima Airport, but could only be on a waiting list for possible cancellations, which seemed almost unlikely to happen. Gasoline was not available anywhere in town, either. But my only thought was that I had to get my son out of the situation here. Luckily I heard from someone that farmers in the neighborhood had had extra gasoline in their big tanks for their green house maintenance. I called one farmer after another and begged to share some of their gasoline. When I could finally collect 20 litters of gasoline, I was almost crying, for our evacuation seemed possible at last. The following day, I put the minimum necessary clothes for my son in a suitcase and made ready to evacuate Fukushima with him. At that time, food and diaper supplies were far from sufficient not only in Fukushima but also in the whole east Japan area. I put all the diapers, baby food and as much water as I could carry in the suitcase without putting any of my own clothes. I literally had only myself. My husband put the gasoline we managed to get in our car and drove us to a city in the next prefecture where Shinkansen trains were running. The traffic was heavy and it took much longer than usual to get there. I found out later that the level of radiation in the car was not much different from that in the outdoors. Looking back, I realize that we got irradiated a lot in our evacuation process. When we came near the first Shinkansen station from where trains were starting, we saw many abandoned cars. I could empathize with the owners of the cars who had also come here earlier to evacuate and fled for their lives. After a long time, we finally reached the station. My husband came to the platform to see us off. A train had been waiting for its departure time. We had 15 minutes. My husband came on board the train and enjoyed sharing the short, precious time together with his son, enduring the hard time to be separated. My husband said he could not go with us because he had a job and the house to be rebuilt. I was, however, worried about his safety. There was no life guarantee back home. The worst fear was that indefinable radiation and its effect on my husband… and on my parents. But we couldn’t help ourselves. I couldn’t stop my tears flowing down my cheeks, thinking this may be the last moment to be together. How I wished I could stop my husband from going back and we could evacuate together! But my wish didn’t seem to reach my husband. He got off the train just before its departure and saw us off from the platform. If the disaster had been only a natural earthquake disaster, we would not have to evacuate. We used to have a happy family life, but had to choose to become separated due to the nuclear accidents and the huge amount of radiation discharge. We could have endured hardship no matter how our house had been destroyed or even if we had to work hard to repay a debt to rebuild our house. I was full of remorse, but controlling my sadness, headed for Tokyo with my son. My son was one year and one month old then. He was simply enjoying his first bullet train ride, understanding neither the evacuation nor the separation from his own papa. Watching such an innocent baby boy, I couldn’t contain my tears. We arrived at Tokyo Station in about an hour. I got off the Shinkansen train and found my younger brother, who lived in Tokyo, waiting for us on the platform. I was really grateful for his help because I was exhausted, having traveled with a one-year-old son, carrying a baby car and a suitcase. As we went through the gate to exit, I saw crowds talking and walking past us just as usual and as if nothing serious had ever happened. It took me a while to accept the gap between the condition in Fukushima and that in Tokyo and to get over the shock and confusion. I was asking myself, “Was it a bad dream or something?” After the few days of survival struggles, I finally had gotten to Tokyo and found everything just as normal as it can be. People were living normal daily lives. Trains and buses were running. Understanding the normal situation, I was so relieved that I felt as if I had lost my legs. My brother let us stay in his one-room apartment until we could find somewhere to settle. He was the only relation whom I could depend on in Tokyo. He was a businessman and often traveled abroad. We have hardly seen each other since then. A few days later, I found a newspaper article telling that the government was offering free housing to Fukushima evacuees. I decided to apply for it, because I had lived in Tokyo when I was a student and knew its whereabouts. Tokyo is not too far away from Fukushima and I didn’t want to go farther away from my family in Fukushima. I did not have any more energy to travel further. I decided to stay a while in Tokyo and see how things would go. We did feel aftershocks frequently in Tokyo, too. TV programs and my mobile phone would often show or sound urgent earthquake alarms. But we did not know how bad the radiation contamination was in Tokyo yet. I started off to go to apply for free housing by taking trains, though both my son and myself were beginning to feel sick. First my son started vomiting, having diarrhea like water and then a fever. After a while, I started having the same symptoms. Suffering from the diarrhea and nausea, I desperately got on a train with only one desire to get a housing arrangement for our future. We had to change trains, too. At one station, I couldn’t stop vomiting and finally squatted down. A station officer came and offered help. I was almost fainting, but I regained my consciousness and left the station. I couldn’t give up. I was determined to apply for our housing no matter what. Somehow I managed to arrive at the housing office, could finish the application procedure and went to a hospital I found on our way back. They said we were both afflicted by Norovirus. They told me I had to get hospitalized by myself without my son because the hospital didn’t have hospitalization conditions in the pediatrics department. How could I alone be hospitalized! I begged them to allow us both to be hospitalized together, but they refused. When the intravenous medication they administered was over and we stepped out, it was already dark. Other hospitals had already been closed. I had no more energy, physically or mentally, to visit another hospital, so decided to go back to my younger brother’s apartment. I had to squat down to vomit along roadsides quite often. Tears streamed down for this trying difficulty. I kept walking along a road beside a national highway, holding my son’s hand, desperately thinking, “I will never, ever let go of this hand,” until at last we arrived the empty apartment. Sickness didn’t go away for a while but I had to wash my son’s vomit-stained clothes, gave him water to drink, and take care of him. I could not even rest no matter how sick I felt. It was a very hard time. I cannot forget the time I was caring my son while crying myself. Such difficult days were overwhelming. I had never experienced that hard life before. But here we were since I decided to evacuate with my son from radiation contamination. “Had it not been for radiation! If only they hadn’t had the nuclear power plants!” The thoughts crossed my mind repeatedly. I also wished my husband had been with us many times. However, the transportation system had not recovered yet and he would not be able to come right away to help us. After a few days, I received the notice that we were accepted into the free housing that I desperately wanted to have. It was a great relief. I was going to be able to settle at least for a while. My life of “boshi hinan” (mother-child evacuation) began. The apartment had basic commodities such as a refrigerator, TV, air conditioner, gas stove, and bedding. How I appreciated them and the people who had prepared them for us! After having our house destroyed by the earthquake, evacuating voluntarily from nuclear fallouts, and keeping double households, our financial situation was really severe. People in Fukushima lost everything in one moment by the nuclear accident caused by the Tokyo Electric Power Company. But actually, Fukushima people had never benefitted from TEPCO, which sends the electric power generated in Fukushima to Tokyo. We, people in Fukushima, use electricity generated by Tohoku Electric Power Company. However, some Fukushima evacuee children in Tokyo and its vicinity were bullied at new schools. Being avoided like contagious diseases, some children said they preferred to suffer from radiation in Fukushima than being bullied in Tokyo. Not a few of them actually returned to Fukushima for that reason. Not only adults but also children were suffering so much that their little hearts were almost ruptured by sadness. They had to face the cruel reality and make a difficult decision to go back. I gradually found out how serious nuclear fallout contamination in Tokyo was. As I had survived the information blackout in Fukushima, I didn’t rely on the government nor TEPCO for information. Trusting my intuition only, I didn’t use the city water from the faucet for cooking and drinking, bought foods carefully choosing the production sites, always wore a mask and a hat whenever we went out, and tried especially to protect my son from rain. When my son needed a lot of physical exercise, we went to a nearby shopping mall so he could run around indoors. However, once in a while I took him outside for a limited duration of time, worrying about radiation, because I felt pity for my active little son to be confined indoors all the time. He had just started to walk. But every time we went outdoors, I suffered from regrets, worrying that he might have gotten irradiated, and detested myself. I was torn inside every day. Two reasons kept us in Tokyo despite my increasing radiation concerns. First, it was not too far away for my husband to come visit us, especially to see our son who had just been one year old. By taking a highway bus, he could come to Tokyo from Fukushima in four hours two to three times a month. It was economically possible, too. The second reason was that I had no confidence in my health condition. I had had asthma and used to carry an oxygen inhaler with me. The coughing fits had been suppressed but had restarted after the earthquake, though I can’t determine whether it was due to the mental stress or radiation contamination. Also, sometimes I fainted due to Meniere’s disease. When its symptoms attack, I lose balance, get dizzy and become immovable. I wondered how I could take care of my son when such an attack came. My husband would be able to rush to rescue us. If he drove on the highway, he could come to Tokyo in about two and a half hours. For these reasons I decided to stay in Tokyo for a while despite some problems that were arising. I suddenly realized I had lost 10 kilograms. A friend of mine, seeing me after a long time, pointed that out and for the first time I realized my weight loss. The blue jeans I used to wear before the earthquake became so loose that I could easily put my fist between my pants and my stomach. That was only after a few months since our evacuation to Tokyo. Soon I began to feel like evacuating from Tokyo. I tried to persuade myself to stay but it became unbearable to live in the fear of getting irradiated. I saw people changing the sand in sandboxes at parks and kindergartens because the radiation levels were too high –higher than the officially set standard of limitation. Unfortunately, the apartment we were accepted to live in was located in the area which had the highest radiation level in Tokyo. Worse still, we had an incinerator of a certain clean-up company right in front of us. Why an incinerator of all bad things! I lamented this bad luck. Tokyo had just started to incinerate the debris from Fukushima. Having lived in Tokyo for about a year, I decided to move to Osaka in March 2012. As expected, my husband and in-laws strongly objected. But I was determined. A few days later, we moved to Osaka and I could finally feel refreshed. The frequent earthquake alarms that I heard in Tokyo no longer bothered me and I could sleep better. However, my husband couldn’t come to see us as many times now as before. Although it takes only one hour to fly from Fukushima Airport to Itami Airport, the cost of a round trip, 60,000 yen, made it difficult. I couldn’t ask for his help or any other family member’s help, even if I got sick because I had moved to Osaka in spite of their opposition. I started to feel a lot of stress, living in an alien city without any close relatives. However, I have lived here in Osaka with my son only to stay away from radiation. To be honest, I don’t know what is the best way for my son. Does it make him happier if we could live together even if he gets ill in the future due to the harm from long-term radiation exposure? Or should I keep him safe from radiation even if he misses his father? No matter how hard I try, I cannot come to a conclusion. I wish someone would answer my questions. Who can answer my questions? How long do we have to continue our split, double life? Will we ever recover a happy family life like before when we lived together enjoying safety in a pollution-free land? As I take in the laundry from hangers outside, I look up at the setting sun and think of the sky of Fukushima 600 kilometers away. I wonder if my husband far away is also looking at the same sky. I wonder what is going on in our homeland that has abundant green nature. Even now after some time since we evacuated from the disaster, tears flow uncontrollably whenever I look up at the sky. I start thinking and worrying, “if my son wants to get married, in the future, to someone from outside Fukushima, I wonder what her parents will say to him? Will they ask him if he can give her a healthy child, if he can stay healthy, and if he can protect his family?” Since we were in Fukushima when the nuclear accident occurred, we may have to endure discrimination. Therefore, we have to continue our evacuee life to defend our health and not to deprive my son of his future. It’s almost a year now since we migrated to Osaka. We are still mother-and-child evacuees and my husband comes to visit us once a month. Nothing has changed so far for us living with anxiety and fear. For example, we are nervous about our daily food. When I shop for food, I always check where they were produced. Our government makes us even more nervous by pushing nuclear power plant restarts in this earthquake prone country. And our health concerns have been doubled or tripled by their incineration of Fukushima debris. Health hazards in broader areas beyond Fukushima has been revealed. The grave condition of the nuclear accident is still going on far from being “under control” and requires attention of emergency. Our future is unknown due to the large amount of daily radiation discharge. Holding on to a dream that someday we may be able to go back to Fukushima, I get frustrated for not being able to do anything much about it. I read a newspaper article once reporting the numerous cases of deaths that could have been saved right after the tsunami disaster. Due to the high radiation dosages, the rescue search of the tsunami victims had to halt. They had to abandon many who were getting weaker but could have been saved. The victims perhaps were waiting for rescue to come for a few days, trying to endure the pain and trying to survive. But nobody came and they died. Had it not been for the nuclear explosion, rescue operations could have saved many more lives. 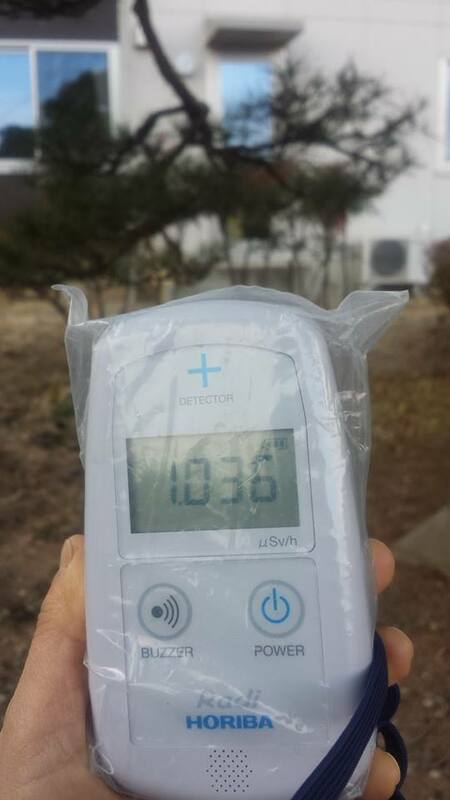 The other day, we had a radiation dosage test of our garden soil in Fukushima. The result was Cs134+Cs137=12510Bq/Kg. What does this mean? Some people have objected making a simple comparison with Chernobyl, but this amount in Chernobyl forces evacuation or compensation for evacuation. However, in Fukushima many people are still living their “normal” daily lives there. We have been accused of being too nervous or labeled as “homeland deserters.” However, it is not normal to have the high dosage numbers from a corner of a house garden. Had it not been for the nuclear accident, we would never have had such high level of contamination. Fukushima has become a split community between “deserters” and those who have stayed. One group evacuated for health concerns, the other has decided to remain and to live with contamination. Both sides have their merits and demerits. We cannot simply determine that one side is correct and the other, wrong. We must respect either decision made by people who sincerely and seriously worried and considered about the future of their younger family members. Others cannot criticize them. The final decision making as responsible parents, I think, depends on individual judgment. I made a decision to evacuate even though our family had to be separated. I had been troubled, unable to judge if that was the right decision or not. However, recently I could finally be convinced that it was right. Soon after we moved to Osaka, my son had a health check-up and they found several “abnormal” problems. I was shocked and cried every night after he went to sleep in another room. However, a recent health examination found that everything is back to normal and he is in good health! I could finally feel relieved, finding out that it had been right to steadily follow the decision for the last two years despite a lot of difficulties. Due to the double disaster of the earthquake and the nuclear accidents, we lost a lot of precious things. We lost precious time that we were going to spend together as a family; my husband lost daily opportunities to see our son growing up day by day; and we lost uncontaminated land and clean air. We can never recover them. However, we have also gained some things. At first, right after the disaster, I was full of remorse and sadness, asking, “Why Fukushima?” and “why us?” But I had a profound realization that the happy and luxurious family life we had enjoyed before, which I had taken for granted, couldn’t return. In this sense, this has been an important learning experience. For the first time in my life, I had to face a risk of death in the midst of the fearful sounds of the rumbling earthquake with a magnitude of 9.0 on the Richter scale. Nowadays, what I see every morning when I wake up is my son’s peacefully sleeping face. I think, “We are alive today, too!” looking at him beside me. Every morning I feel grateful for the fact we are living. I also found many people and many things for which I am thankful. I have received a lot of help since we moved to Osaka. Actually, we had moved to four different cities before Osaka. I had never been to Osaka before. I had not planned to come to Osaka, but happened to come to Osaka without having any acquaintances. I was alien to Osaka dialect and culture, but it is miraculous to think how I have met these friends in Osaka. I thank every one of them and want to live appreciating each connection. Now let me tell you about one thing I have held in my mind… what I have come to realize about life. After experiencing the great disaster, which I could not have even imagined before, I feel it didn’t happen simply accidentally but came in an inevitable course of events. In other words, everything, including both good and bad, has a meaning as what happened to myself. We have lost a great deal due to this nuclear accident. But now standing at a turning point of life and realizing the meanings of things, and reflecting upon the way how I should live my life from now on, I have come to see myself as a survivor. It is a great victory to have discovered the way of living thanking every single day as a precious meaningful time. Now it is almost two years since the disaster. We hardly hear about what is actually happening in Fukushima or what concrete health problems have risen. Probably most Japanese live without knowing much truth about them, because they never surface. So now, what can we do to protect our own family members, the most precious people in our lives? I have learned the following through my own experiences. It is necessary to be always on the lookout for information, to develop ability to see through truth out of a lot of misinformation, and not to be confused or easily affected by it. Then to have the following three abilities is necessary and not any one of them should be lacking: the ability to make a right judgment, the ability to make a right decision and the ability to take action. It is regrettable, but my country didn’t consider it a priority to protect its people. Perhaps it won’t change. We just have to protect ourselves as long as we have chosen to stay in this country. I would like to live on with smiles without wasting time for negative thoughts in this evacuation life which seems to last endlessly. I would like my son to acquire the strength and wisdom to defeat any adversity. I may not be able to leave him a lot of money or property, but I hope, I can leave him the art of surviving and living independently. I think this is the duty of my life now. と引っ越してきた当初は何度も自己嫌悪に陥りました。 私がもう少し東京で頑張っていれば息子は大好きな父親ともっと会えたはず。 私が2人を引き離してしまったのではないか・・・と。 息子にとってどうすることが一番良いのか、正直私には分かりません。 被曝をし続け将来病気になってでも家族が一緒に暮らせる方が幸せなのか、 家族がバラバラになり息子に淋しい思いをさせてでも被曝を避けるべきなのか、 何が一番良いのか、どんなに考えても答えが出ません。 誰か教えて下さい。誰に聞けば答えが出るのですか? My name is Akiko Morimatsu. 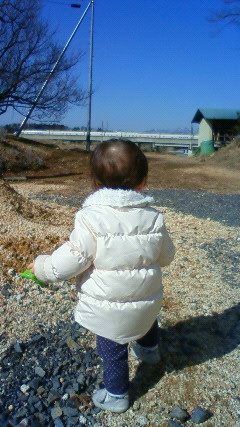 I have been living a life of “boshi hinan,” or “mother-child evacuation” with my two children in Osaka ever since we evacuated Fukushima four years ago. I believe that the right to enjoy a healthy life in a radiation-free area is one of the most important human rights concerning human life and health. The right should be respected equally among all people. It is only natural for human beings to wish to avoid radiation exposure as much as possible. This wish should be granted equally to all people. It is also natural for parental psychology to want their children with future to grow up with as little health risk as possible. All parents want their children’s healthy growth. There should be absolutely no shadow of radiation fear nor heath risks. Would it be reasonable if only some lucky people could flee from radioactive areas because they happened to have relatives or supporters in other areas? Would it be appropriate for a civilized society if only wealthy or lucky people could leave the radiation-contaminated areas? It seems you announce one appalling new policy after another. Take, for example, the new policy of cutting housing support for Fukushima evacuees, while giving generous support exclusively to Fukushima returnees. Were you aware of the extreme suffering of those parents whose only choice was now to unwillingly return to the contaminated areas even though they strongly hope to stay away for the sake of their little children? Would you call this a truly fair policy? Would you be able to call this right? I wonder, to begin with, if both the central government and Fukushima government have made policies for the last four years with the proper understanding that many households simply have not been able to evacuate the contaminated areas even when they wanted because there were no appropriate, supportive public policies for them to choose evacuation to continue their life in a safe environment. If you have not been aware of such people’s struggles, I must question your ability as political leaders to hear the silent voices of the common people living their common lives. I don’t mean to sound impudent, but I cannot help wondering if this failure is as grave as the incompetence of our past political leadership. Please reflect upon the fact that the “Nuclear Accident Child Victim Support Law” was made in 2014 but has been shopworn. The law has not been activated nor have the victimized children been helped by it at all. What do you think of this fact? I have never thought harshly of those people who have been obliged to remain in Fukushima or those who have chosen to live with radiation contamination. I deeply care about them and feel strongly empathic with them for their difficult situation as parents raising young children. However, we evacuees are also the same Fukushima people. Even though we have evacuated to far away places with children, we sincerely wish to be able to return to Fukushima if only Fukushima returns to the uncontaminated state as before 3.11 without any health risks or anxieties of losing health. If only Fukushima could get rid of all the radiation contamination as before 3.11, we would be very happy to return with all of our family members. We have wished this for four years now. I sent a letter to the former Fukushima Governor, Yuhei Sato and also a copy of my book entitled Evacuating Fukushima with my Children: Mental Locus to Reach the Family Decision to File a Law Suit to plead evacuee support. I, however, wonder if he heard the silent voices of Fukushima evacuees. I also would like to plead to the current Fukushima Governor Masao Uchibori also not to abandon those who chose to evacuate Fukushima; they are Fukushima people after all. Please, respect the basic human rights of the people regarding to their life and health protection. Also, please give generous support and keep practicing concrete, compassionate support policies for evacuees. I am afraid, more than anything else, of the possible easing the way for infringing numerous human rights in the future if the governmental responses so far after the nuclear accident have become established as common devious methods to do away with problems. Can there be anything more precious than human life and good health? 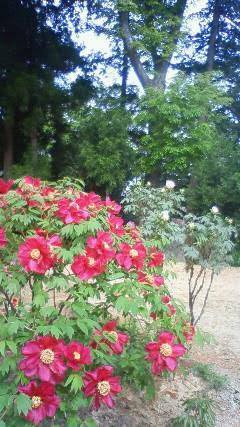 Japanese people and Fukushima people as well, have, all equally, the right to protect their own lives and enjoy good health. I implore you, hereby, to give the minimum legally guaranteed protection to the people who have chosen to take the fundamentally human action to protect precious lives and health. Unfortunately, we have had nuclear accidents. I would like to, therefore, take action which we can hand on for posterity with pride in the future as citizens working together with the Fukushima Prefecture government. The same position and hope can be referred to our national government, as well. Therefore, please listen not only to those partial groups of people interested merely in economic gain, but also to this sincere mother, a hard-working life supporter, a loving prefectural citizen, and a true Japanese citizen. 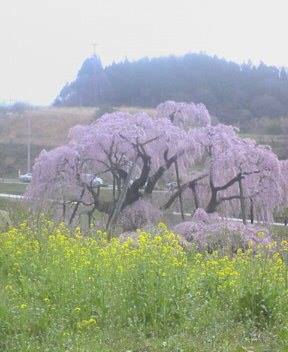 Thank you for reading my humble letter written as a Fukushima citizen, wishing the recovery of Fukushima and as a Japanese citizen also wishing for the true reconstruction of the entire East Japan from the earthquake and tsunami disasters.